Haven Hideaway - Home with All the Views Copalis Has to Offer! Talk about a view! Talk about a view! Sorry, but everyone loves the view. Every room in Haven Hideaway has spectacular scenes of the beach, the dunes, and the ocean. 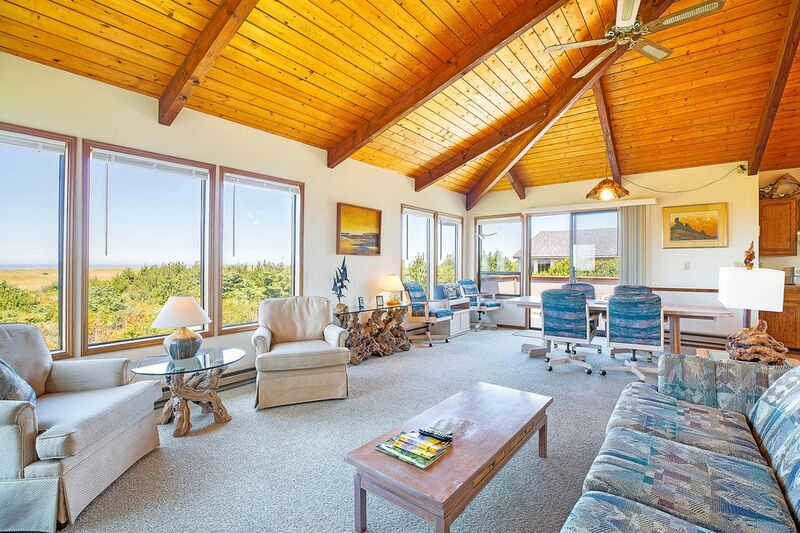 In addition to the views, the home is truly beachfront with a stream and, did I say, incredible views? Our family loves it here. The place sleeps 6 in 3 bedrooms so you can bring your friends or the kids and grandma. That way everyone is ready for scenic fun at the beach. Have you been to Copalis Beach before? We are North of Ocean Shores, quieter but still a quick drive into the restaurants, shops, bike and moped rentals, horse biking riding and more. You can walk directly out to the beach. There is stream you can wade most of the year. In winter the small bridge is just 2 blocks north. Either way it’s a joy to feel the ocean air, see the birds and experience the mighty Pacific Ocean. The kitchen is fully outfitted with pots, pans, oven and range. For the table you'll find plates, flat ware and more. You can make a nice family dinner here without feeling cramped. "Our family picked Haven Hideaway to rent and we have been back every year. Just perfect for us" - Jonathan. "Dad fell asleep on the deck when the sun went down so we left him out there until it was time to roast marshmallows". - Cynthia. You may just want to spend most of your time on the beach that is just down an easy foot path to the wide flat gray sand. Watch the birds, jump the waves. You can have a full day kit flying, collecting agates or counting your sand dollars. Then come home to the upstairs where you'll find the living room, dining room, kitchen, and one of the bedrooms this one with a queen bed and 1 bath. And let's talk about a view again. Yes, there it is from the chairs and couch in the living room. Or you can sit out on the second floor deck, watch the sun go down and smell the sweet sea air. Ahh it’s the life. Downstairs is where you will find the other two bedrooms. One has a full queen bed, and the other has two twin beds with another sitting area. The lower level also has a laundry room and 3/4 bath. Visiting during the warm weather? Get ready for the best season! The warmer days means you can go fishing, beachcombing and walk the scenic beach hiking trails. Love spending time at this one home! The sunset are amazing!! Home offer a lot and just minutes from the beach. The kitchen offer everything you'll need. The house is beautiful and we like the location. Thank you very much for our stay. We loved our girls weekend visit to the Haven House. Beach access was great, and the house was well equipped with the basics. Would stay again for a short stay- beds would need to be updated for anything longer than a couple nights. Overall amazing view and great location. Only a fool would come here twice. I rented this place for a family Spring Break getaway....bad decision. In addition to to rental fee you pay a cleaning fee as well...We arrived in the area early and wanted to check in before the % PM check in time....who has a 5 PM check in time? The day is already gone (1st indication the the choice was wrong). They said I could call and if it was rented the night before then I could check in earlier. I called and they said, OK 4 PM unless they charged an additional fee! (2nd indication). We decided it wasn't worth messing up the who;e day so we arrived at 5 PM. Now understand you have to confirm by phone you have arrived at the house....there is not cell signal at this place and they do not have wireless here either. I had to drive three miles to get a signal to confirm arrival. I found the place very dusty in many pats and had to clean some of the furniture myself. The 8 year old girls were putting their stuff in the two twin bed room when I heard screaming. Rushing down stairs they were all excited because there were dead grub worms and bugs on their sheets under the blankets. Dead worms on the floor and several bugs on the walls. The deck off the dining area would have been nice but the furniture was filthy with algae and sand...I did not feel like cleaning that too. I guess the cleaning fee does not cover the deck furniture. The T.V. service has 13 channels....no sports or movie channels....so the T.V. was worthless to kill time. No wireless, no cell service so you are stranded. Two toilets....one had a roll of Toilet Paper with 75% of the paper the other 50%....had to go buy some. What? They cannot afford to have a couple of roll of TP? They email you a check list....of yeah...your cleaning fee takes care of what? We were REQUIRED to remove all the sheets from the beds and place them in the laundry room....why? $129 cleaning fe apparently only pays for a two foot move of the laundry to the machine. The bed mattresses are old and uncomfortable. The view is nice which is the reason for two stars. There is no garage. Bikes will stay outside. Place seems to be safe...we had no issue. This was our first time renting an actual residence. It was a great experience and we plan to do it again soon. RATE NOTES: Rates vary by day of the week, and time of the year. Bookings are not confirmed until dates are known to be available. Although bookings are usually not cancellable once made, guests may request a re-sell and, if successful, payment may be refunded less a re-booking fee and costs. The following rates may not be indicated in quotes and will be charged at the time of payment, or later. Deposit, Deposit Waiver. Housekeeping, Hot Tub or Pool Fee, Undisclosed Guests, Unauthorized Vehicles, etc. All fees quote before guest confirms booking.